Located atop Lookout Mountain in Georgia just six miles from downtown Chattanooga, Tennessee, Rock City Gardens is an enchanted, 4,100-foot walking trail showcasing soaring rock formations, caves and lush gardens. Nearly a half million people from all over the world visit this natural attraction each year. Special Features: * 60 to 90-minute, self-guided walking tour along The Enchanted Trail that gently meanders through the 14-acre property. * Massive rock formations estimated to be 200 million years old * Gardens featuring more than 400 different species of native wildflowers, plants, shrubs and trees. 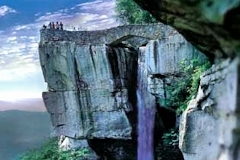 * Panoramic views of seven states from 1,700 feet above sea level * View of the Chattanooga Valley and Missionary Ridge-Civil War battlefields * Some points of interest along The Enchanted Trail include: o White Fallow Deer Park o 100-foot waterfall o 1,000-ton balanced rock o Swing-A-Long Bridge (ideal for pictures) o Legendary view of seven states from Lover's Leap o Fairyland Caverns and Mother Goose Village Image and info via seerockcity.com.